At 7 PM on Feb. 23, 1942, Goleta residents were settling in to listen to President Franklin Roosevelt’s Fireside Chat on the radio. The Japanese had just attacked Pearl Harbor two and a half months earlier and tensions were high for folks living on the coast. Meanwhile, a 365 foot long Japanese I-17 sub came to a stop off of the Ellwood coast. Commander Kozo Nishino had visited Ellwood many times before the war, loading crude oil in a navy tanker, so he was familiar with this coastline, especially one particular cactus plant. Nishino gave the order to prepare for action. A gun crew quickly took aim at a huge Richfield fuel tank just beyond the beach. 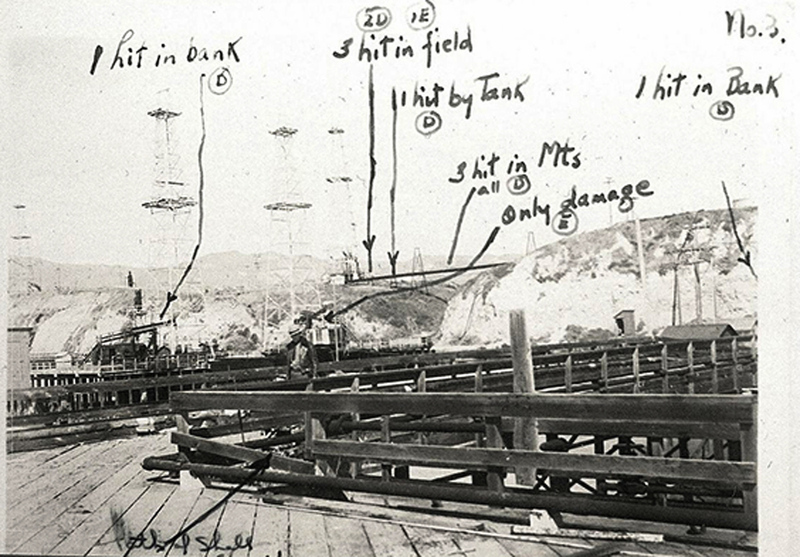 The submarine had cruised to the Santa Barbara Channel with orders to bombard the Ellwood oil installations near Goleta. 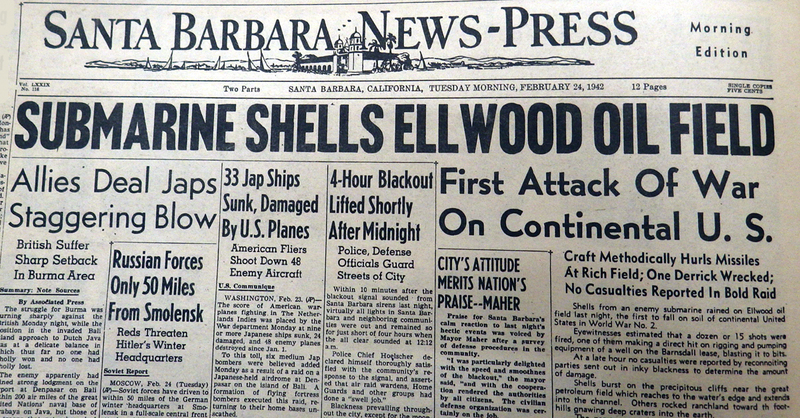 Ellwood boasted one of the largest oil fields in California and, unlike San Francisco or Los Angeles, did not have a major military presence, making it an attractive target for the Japanese Navy. Goleta did have a Coast Guard patrol boat stationed nearby, the Marines had a fleet of patrol bombers stationed at the Goleta airport, the army had troops spread along the coast as shore patrol, plus two howitzer cannons were at the ready, one at Coal Oil Point and the other at Ellwood. Mysteriously, all these defenses were relocated just days before this attack! Leaving only civilian volunteers at aircraft spotting stations. 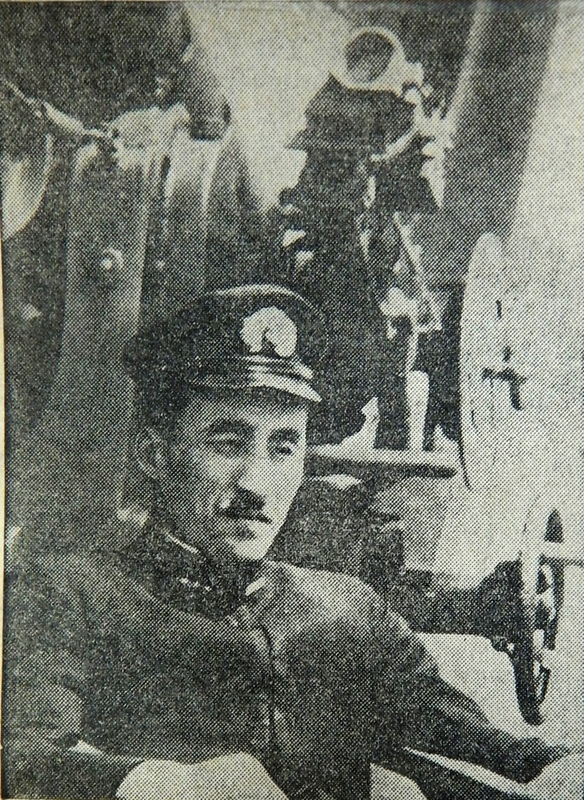 Nishino ordered his men to fire at 7:15 pm, their first rounds landing close to one of the storage facilities. Most of the oil workers had gone home for the night, but the few that remained on duty heard the first rounds impact. They suspected an internal explosion, but a worker spotted the I-17 in the dark. An oiler named G. Brown later described the attacker as so big he thought it was a cruiser or destroyer, until he realized only one gun was firing. Nishino changed targets to a second storage tank. Brown and the others immediately called the police, but by this time Nishino’s men had fired several more rounds. Wild shells landed on a nearby ranch. One round passed over Wheeler’s Inn, next to the classic filling station that still stands today, and owner Laurence Wheeler called the Santa Barbara Sheriff’s department. The deputy told Wheeler that warplanes would arrive shortly, but no planes came. 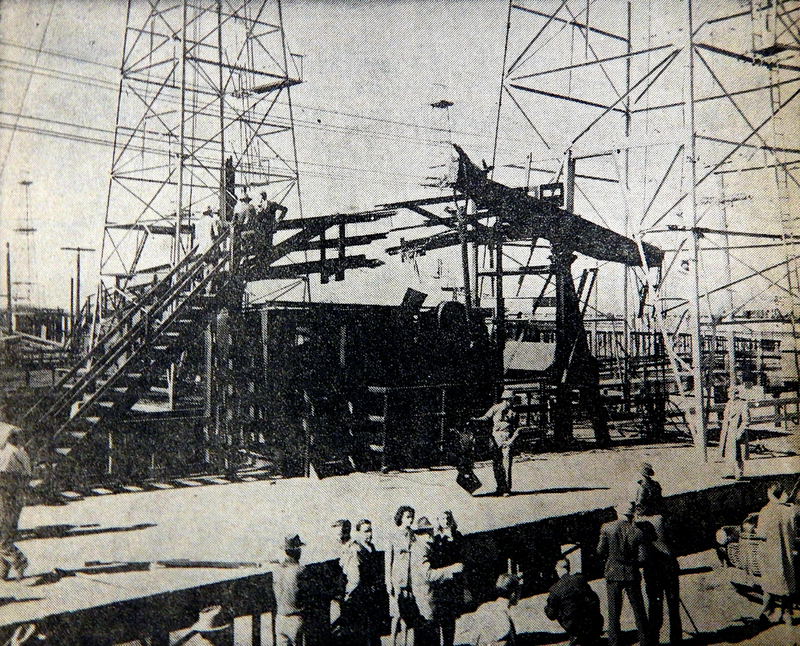 A shell did strike the Ellwood Pier, damaging it slightly. 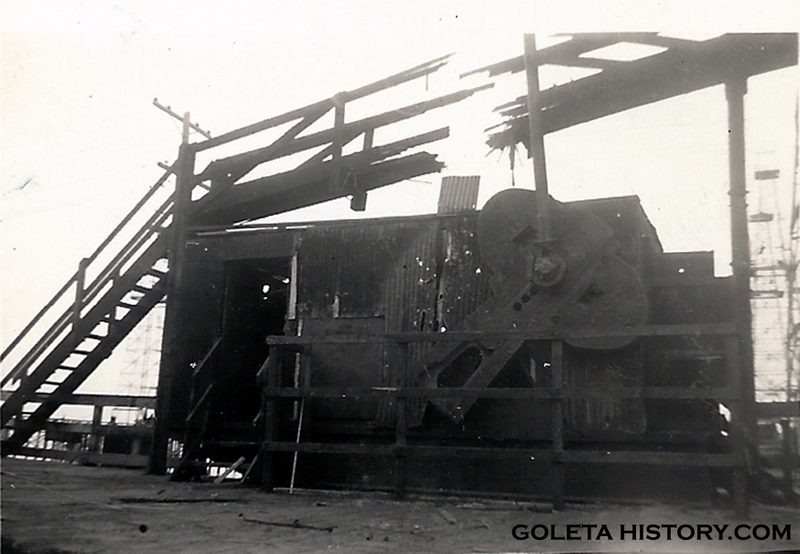 A derrick and pump house were destroyed, while a catwalk was damaged. Torpedo officer Nobukiyo Nambu climbed up the hatch to have a look and reported seeing, “a great deal of confusion”. 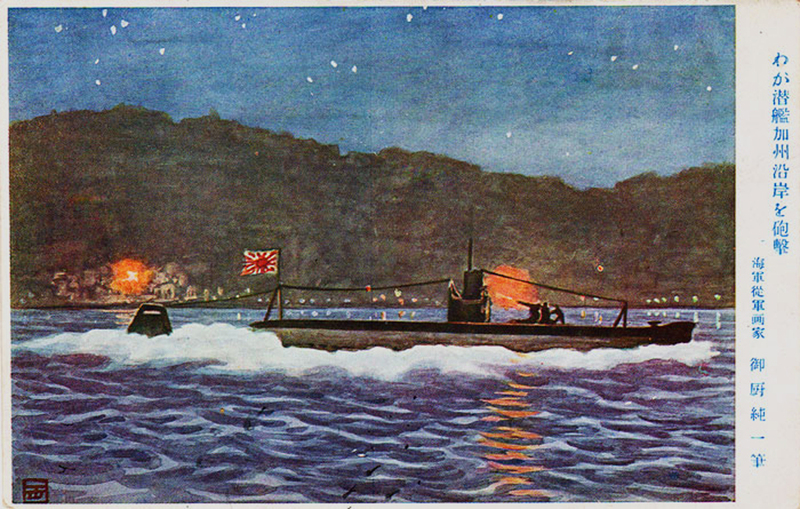 After 20 minutes, Commander Nishino ordered his men to cease fire and the giant sub disappeared into the sea. In August, 1943, this I-17 submarine was sunk by the Royal New Zealand Navy and US Navy planes near Australia. A lone soldier keeps watch over Winchester Canyon while sitting beside a shell crater. There was panic, mayhem and confusion. Phone lines were jammed with concerned citizens trying to find out what the explosions were about. The first phone call to get through to the News-Press was from a witness up at the Trout Club on San Marcos Pass. The night editor told the caller he was “loco” and hung up on him. Soon, the paper’s switchboard lit up with callers. Commuters on the highway were puzzled, but not alarmed by the “fireworks” they saw offshore as they passed through Goleta. A small crowd gathered at Wheeler’s Inn, exchanging stories and concerns for safety. By 8 PM, a blackout was in effect from Monterey to San Diego. All traffic was stopped on the 101 from Gaviota to Ventura to enforce a full blackout. Total damage from the attack was assessed at $500. While the attack caused only minor actual damage, it had a significant impact on public fears. Security was tight, but a handful of reporters were allowed to inspect the damage firsthand and report on the incident. In the following days the hysteria continued, and hundreds of people fled the area. 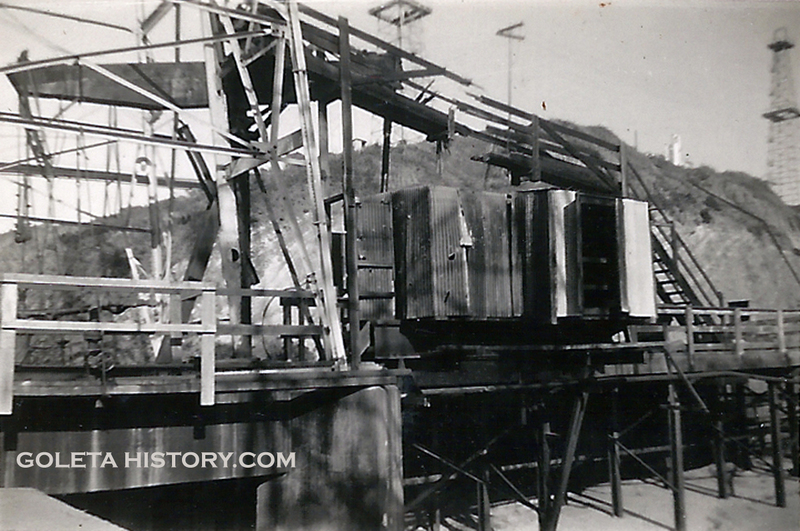 The next few photos have never been seen before as they were provided to Goleta History by John Staneff. His family lived in Winchester Canyon at the time of the bombing and they took these photos soon after the event. The shelling was the first attack on the mainland U.S. in World War II and it triggered widespread fears of invasion and subversion. Within months of the attack, tens of thousands of Japanese Americans would be sent to internment camps, where they would stay until early 1945. Two days after the raid, a broadcast from Radio Tokyo announced, “Santa Barbara, California was devastated by enemy bombardment”. Records of the Japanese Imperial Navy stated that they, “left Santa Barbara in flames”. Above is a Japanese postcard commemorating the I-17 shelling of the Ellwood refinery and storage facilities north of Santa Barbara. Image courtesy John Geoghegan. Unfortunately, the “Flying Santa Barbaran” bomber was never built, and the “Ellwood Avenger” attack plane never attacked anything, ending it’s short career when it banged into another plane on a Florida runway. Less than two months after the attack in Goleta, James Doolittle and his Raiders would lead the first of many U.S. air raids on the Japanese homeland, showing that Japan was vulnerable to air attacks. In 1953, Tex Blankenship purchased 20 acres of Ellwood land with the intention of building a restaurant on it. 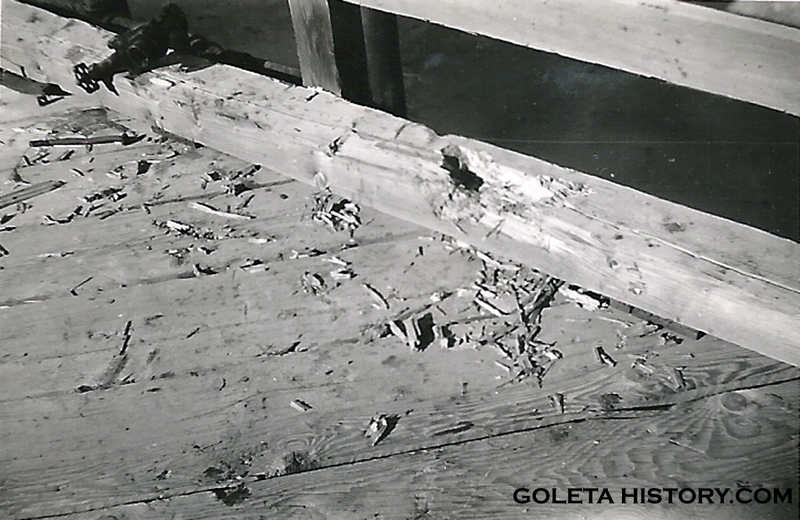 Tex also purchased timbers from the Goleta oil field pier that was bombed by the Japanese during WWII. He used them to start building the Timbers restaurant, but it was not opened until 1963 when the Velliotes family bought it. Today it sits closed. This sign can be found at Haskells Beach, commemorating the attack on Ellwood. See a cool video about this event. Thank you so much for this beautiful glimpse in Goleta history. I love our town and we have been residents here since 1995. Our town is and has been very under appreciated in a economic and intellectual value which we in majority contribute to SB County. We are one of the top hi tech industrial small towns in the California; Science magazine shows that Goleta is in the top 5% and, when the size of the population is taken into account, one of the top 5 research/enterpreneurship cities in CA alongside such places as Menlo Park (Xerox) and Palo Alto (Stanford-Silicon Valley). Awesome history. Love being a Goleta native. Excellent account of the attack. It certainly clarifys and adds to what I had heard about the attack as a kid. “Ellwood was attacked by mini subs”! Not true! This sub was very large. 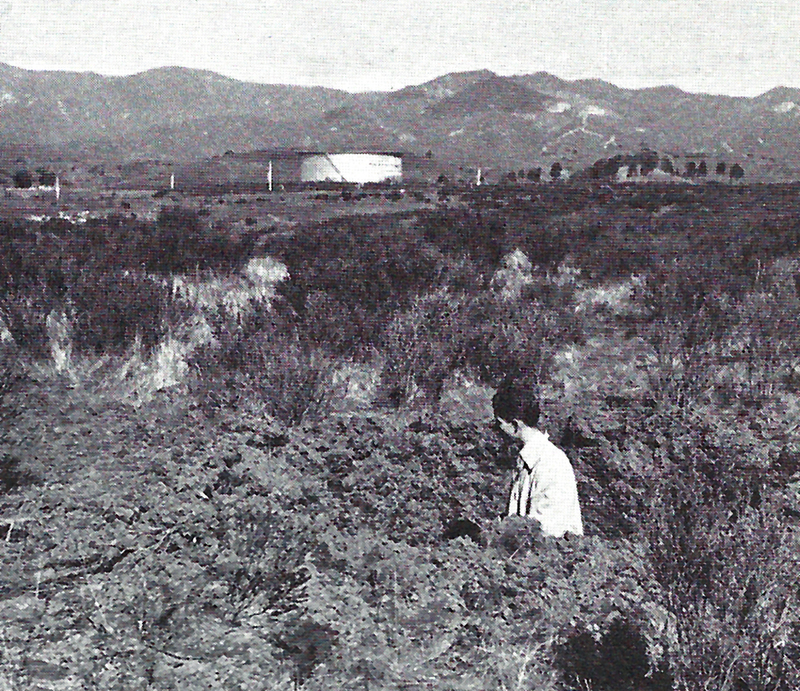 Sadly, this attack led to the enlargement of the airport which meant that the natural Goleta Sough was filled in by removing earth from the historic plateau that the Chumash had once inhabited and cultivated. I have a BUNKER on my property on meigs rd. water or army or ??? Does anyone know the history ???? Santa Barbara historian Neal Graffy thinks there was ammunition storage in that area during WWII. I gave him your email. Sometime around 1960-1965 while living on the Mesa in Santa Barbara, my brother & I were digging around the base of an old dead tree in our greenhouse & found an old bomb. Police were called & all I can remember is that it was a supposed Japanese bomb fired in 1942 & said bomb was disposed off the end of Fisherman’s Wharf. Was this incident published anywhere? I’ve been curious all of these years. Thanks! Great story! I’ve never heard of this incident. But I am quite sure the Japanese never shelled the Mesa. The U.S. military did have some arms bunkers on the Mesa however, and that would be my guess as to where the shell came from. My grandfather was superintendent of the Signal Oil and Gas Company pumping and gas compression plant a little north of Goleta on the 101. He worked there from about 1935 until retirement in 1966. He was superintendent in late ’50’s up until retirement. They lived on the property. The houses and I believe all the associated buildings were razed, but the pier is still there and still in use. Now used as a dock for boats running workers out to offshore rigs. The pier used to be twice as long and had oil wells and pumping equipment on the end of the pier. I was 8 when he retired but have very fond memories of Goleta. I stayed with my grandparents a lot. Went to kindergarten at Ellwood Elementary school. I have many stories about that place. Fished off of that private pier until the late ’70’s. My family spent our 1965 family vacation on a bunkhouse that was once on the pier. It was August 1965, I had just turned 7. We walked to the end of the pier and saw an orange glow in the southern sky that was Los Angeles on fire during the Watts riots. We lived in L.A. and were glad we weren’t there at the time! My dad and I also found that tip of a missile or something while beach combing that same summer. Probably from the nearby air force base. Great memories. Come on, History Channel, you can do better than that. Sixty miles?! Wow, that must have made quite an impression on you. Thanks for sharing that. In 1985 I was 15 and lived right by there. The pictures here reminded me that I found a crater in a field by the beach (Santa Barbara Shores County Park). I always thought that was odd. I wonder whether that was from the shelling?